Build Losing the smartphone war means Microsoft is taking PC-phone integration seriously again – including the never-quite-solved problem of getting desktops and mobiles to work nicely together. Quite why the worlds remain unbridged is a mystery to some. Or not such a mystery, if you consider the incentives involved. No single company figures prominently on both mobile and PC platforms, so nobody has a strong incentive to bring the bridging software to someone else's platform. If you surrender to Apple, you'll have seamless messaging across your iDevices, and they'll all go off (Mac, iPhone, iPad and Watch) when you get a call. But that's only inside the Apple ecosystem. Samsung's SideSync and Flow try to replicate this confusingly in different ways, so you can make calls and sends texts from the PC, and share items across devices. But the chances are if you have a Windows PC and a phone that isn't from Samsung, you'll live in two separate worlds. At Build 2018, Microsoft promised a new bridging feature, "Your Phone", which will be able to do some of this at platform level. A new 'Your Phone' experience that enables a window into a user's phone right from their PC for instant access to text messages, photos and notifications. Imagine being able to quickly drag and drop your phone's photos into a document on your PC in one swift movement – without having to take your phone out of your pocket. 'Your Phone' will begin to roll out in the Windows Insider Program soon. The accompanying image showed a standalone app rather than an integrated system service, and support for just photos, messages and notifications. No calls as yet. 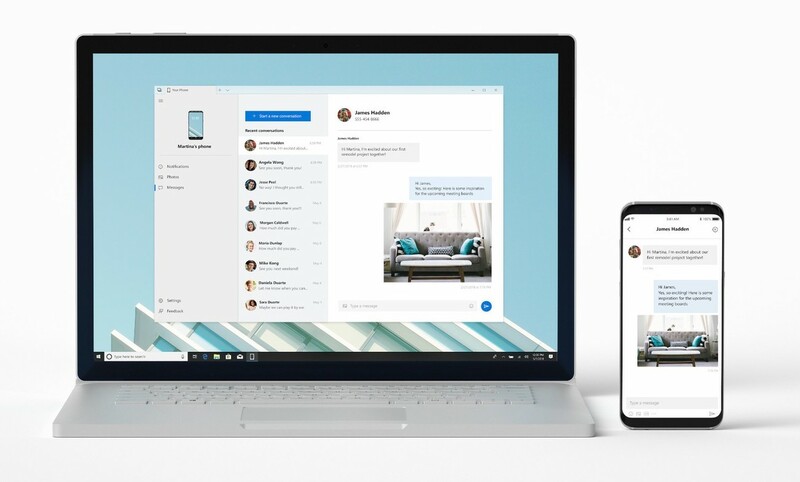 It's hard to get excited about something so conservative – arguably more conservative than the short-lived attempt to make Skype the centerpiece of unified messaging, by making it the default SMS client, and delivering Skype messages to all devices. That lasted as long as any Skype strategy ever lasts – less than a year. And there's no release target yet – so it may be autumn or even 2019 before it's rolled into Windows. Customers won't need to buy Microsoft devices or even Windows devices to take advantage of the new "experiences" the company plans to deliver. More experienced readers may recall Nokia's Suite attempting to do PC SMS in the Noughties, but it was BlackBerry that tried to put a PC-phone bridge on a secure footing with its Blend software. 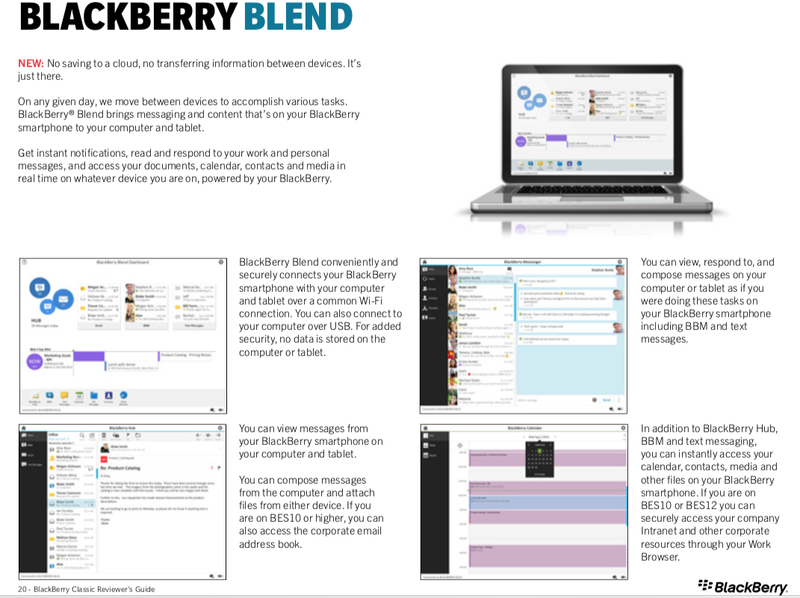 Blend was a PC or Mac app that required a BB10 phone and a BlackBerry ID for authentication, and created a secure encrypted connection back to a PC – which may be on the other side of the world. Billed as a "mobile network hub", Blend didn't make voice calls, but it handled SMS and BBM replies, email from multiple accounts, allowed files to be accessed from the local device, and could open sandboxed web pages via Chrome. Sadly, as BlackBerry switched direction to licensing Android, it never brought Blend along with it, even as a paid-for business offering.